One of the watchwords of Vladimir Putin’s presidency is patriotism. The Russian president has attempted to define his system as one where ordinary Russians can feel a sense of pride in their country, and where feeling patriotic in turn makes a true Russian citizen. Russia’s current social contract, in the concept of governance made famous by philosopher Thomas Hobbes’s 1651 Leviathan, is one where the leader and his citizens are bound together by a sense of patriotism. 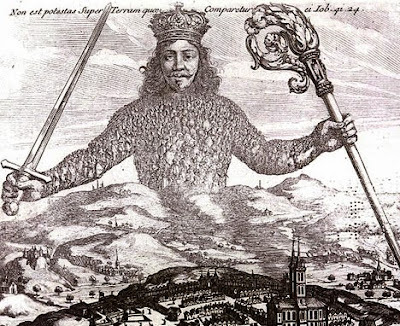 Hobbes’s Leviathan takes its title from the sea monster in the Book of Job, a creature that no man was able to master. Hobbes intends the Biblical theme to suggest that, left in their natural state, humans would be always in conflict. What is needed, according to Hobbes, is a commonwealth in which a group of people mutually agrees to be governed by an authority figure. This new commonwealth was the new Leviathan: a metaphoric creature made up of the citizens as its body and the ruler as its head. In calling his concept Leviathan, Hobbes took the Biblical beast and made it synonymous for the state itself. This commonwealth — both Hobbes’s concept of one and the one constructed by Putin – is key to understanding the ongoing debate over Andrei Zvyagintsev’s remarkable film, Leviathan. The reason why so many have been riled up by Leviathan’s subject matter is easy enough to detect. The film follows the story of one man, Kolya (played by Alexei Serebriakov) and his attempt to save his house from the machination of a local mayor, Vadim (played by Roman Madianov). Kolya’s house sits on a beautiful piece of property overlooking the rugged natural landscape surrounding the town. The mayor wants it for purposes that are only revealed at the end, and employs the local police, judiciary and Orthodox clergy to obtain it. Zvyagintsev’s film is both universal, as the director claims, depicting how the little man cannot win in a struggle with the more powerful, but is also deeply Russian in its portrayal of official corruption, injustice, and amorality. Vadim’s desire for Kolya’s land, as the film makes clear, comes from above, both in the form of a more senior official and from the official Church. No wonder so many politicians and clergymen have found it offensive; Leviathan exposes the Putin-era commonwealth as a corrupt one: its implicit message suggests that the Hobbesian-like obedience demanded of the people to the state is misplaced. Leviathan also brings into sharp focus the ongoing debate about the nature of Russian cinema and its role in the new Russia. A major discussion within the Russian cinematic world since the 1990s is the way that domestic movies portray the country. In May 1998, Nikita Mikhalkov, the Academy-Award winning director of 1994’s Burnt By the Sun, famously showed a series of clips from late 1980s and early 1990s movies at a special meeting of the Russian Filmmakers Union and declared that they had presented a bleak, unpatriotic vision of Russia. What was needed, Mikhalkov suggested, was an end to the so-called culture of chernukha, or dark cinema, and for filmmakers to create new heroes. For the most part, Russian filmmakers responded to the call: throughout the 2000s, domestic blockbusters helped to foster a new patriotic culture. By selecting it as the official submission to the Academy Awards, the Russian Oscar Committee bucked recent trends to select movies that present the “right” sort of patriotism, particularly films that depict bravery and sacrifice during wars. Fedor Bondarchuk’s Stalingrad (2013) and his Ninth Company (2006), Karen Shakhnazarov’s White Tiger (2012), and Nikita Mikhalkov’s Burnt by the Sun 2: The Citadel (2011) were all recent selections that contain the patriotic culture that has defined the last decade. When Leviathan won the Golden Globe for best foreign film, most major Russian media outlets reported both the victory and the controversy. Conservative daily Izvestia carried a brief article about the Golden Globe and a longer one entitled “Leviathan: A Beauty or a Monster” that asked whether the film should be celebrated or condemned. For its supporters, Zvyagintsev’s Leviathan is a work of art that shines a much-needed light on social problems in Russia. Seen through the eyes of its detractors, the movie depicts a Russia that the West wants to see, a nation whose economy is “in tatters,” and therefore one that offends the Leviathan constructed by Putin.